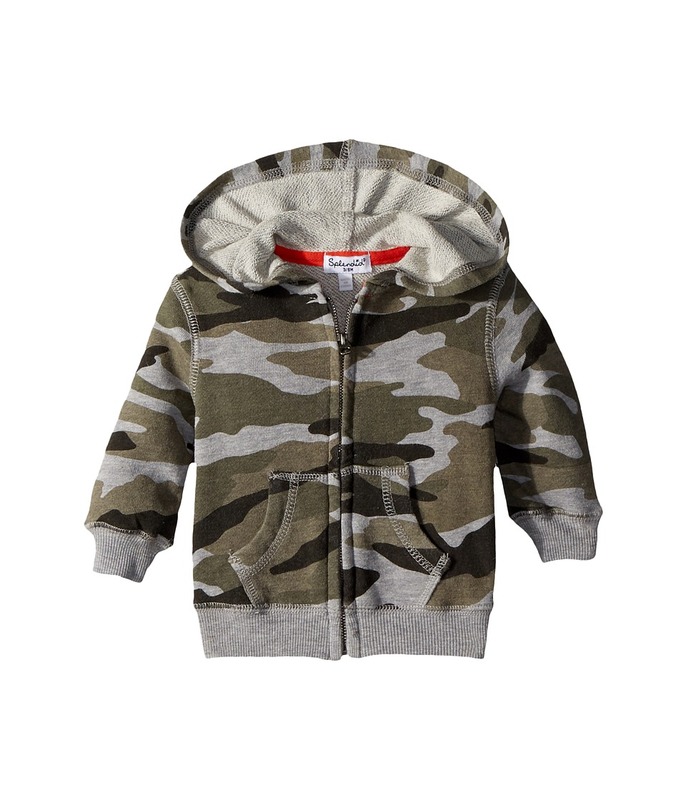 He~ll be the king of peek-a-boo in the Camo Hoodie! Soft cotton-blend fabrication featuring a camouflage print throughout. Attached hood. Long sleeves with banded cuffs. Full zippered front closure. Hand pockets. Matching solid trim at wrists, hem and hood lining. Straight hemline. 60 percent cotton, 40 percent rayon. Machine wash cold and tumble dry low. Measurements: Length: 13 in Product measurements were taken using size 18-24 Months. Please note that measurements may vary by size. You don~t have to shout to stand out! Make a splash with the sleek swim style of a Splendid Littles Color Blocked Bikini Set. Two-piece bikini features a rib-knit outer face and contrast band for a simple, color-blocked look. Lightweight, quick-dry swim fabric in a comfortable, stretch knit. Top: Bikini top features a bralette silhouette. Fixed shoulder straps. U-neck and scoop back. Elastic, under-bust band. Bottom: Bikini bottom features a classic silhouette. Moderate rear coverage. Fully lined. Body: 96 percent polyester, 4 percent spandex Lining: 92 percent nylon, 8 percent spandex. Machine wash and tumble dry. Imported. Measurements: Length: 9 1 2 in Front Rise: 8 in Back Rise: 8 in Product measurements were taken using size 12 (Big Kid). Please note that measurements may vary by size. If you~re not fully satisfied with your purchase, you are welcome to return any unworn and unwashed items with tags intact and original packaging included. You don~t have to shout to stand out! Make a splash with the sleek swim style of a Splendid Littles Color Blocked Bikini Set. Two-piece bikini features a ruffled fringe for a feminine finish. Lightweight, quick-dry swim fabric in a comfortable, stretch knit. Top: Bikini top features a fixed triangle silhouette. Adjustable halter tie. V-neck. Elastic, under-bust band with back S-clasp. Bottom: Bikini bottom features a classic silhouette. Moderate rear coverage. Fully lined. Body: 89 percent nylon, 11 percent spandex Lining: 92 percent nylon, 8 percent spandex. Hand wash and dry flat. Imported. Measurements: Length: 4 1 2 in Front Rise: 7 1 2 in Back Rise: 7 1 4 in Product measurements were taken using size 8 (Big Kid). Please note that measurements may vary by size. If you~re not fully satisfied with your purchase, you are welcome to return any unworn and unwashed items with tags intact and original packaging included. The Splendid Littles Boarder Stripe High Neck One-Piece brings timeless surf style to the consummate beachcomber. One-piece swimsuit features a patterned dot design that sets off the geometric, horizontal stripes. Lightweight, quick-dry swim fabric in a comfortable, stretch knit. Halter tie at neck. High neckline. Moderate rear coverage. Fully lined. Body: 86 percent nylon, 14 percent spandex Lining: 92 percent nylon, 8 percent spandex. Hand wash and dry flat. Imported. Measurements: One Piece Length: 23 in Product measurements were taken using size 14 (Big Kid). Please note that measurements may vary by size. If you~re not fully satisfied with your purchase, you are welcome to return any unworn and unwashed items with tags intact and original packaging included. The Splendid Littles Boarder Stripe Tankini Set brings timeless surf style to the consummate beachcomber. Two-piece tankini set features a patterned dot design that sets off the geometric, horizontal stripes. Lightweight, quick-dry swim fabric in a comfortable, stretch knit. Top: Tankini top features a lightly fitted, halter-top silhouette. Halter tie at neck. V-neck. Straight hemline. Bottom: Bikini bottom features a classic silhouette. Moderate rear coverage. Fully lined. Body: 86 percent polyester, 14 percent spandex Lining: 92 percent nylon, 8 percent spandex. Hand wash and dry flat. Imported. Measurements: Length: 14 in Front Rise: 7 in Back Rise: 7 in Product measurements were taken using size 8 (Big Kid). Please note that measurements may vary by size. If you~re not fully satisfied with your purchase, you are welcome to return any unworn and unwashed items with tags intact and original packaging included. The Splendid Littles Boarder Stripe Bikini Set brings timeless surf style to the consummate beachcomber. Two-piece tankini set features a patterned dot design that sets off the geometric, horizontal stripes. Lightweight, quick-dry swim fabric in a comfortable, stretch knit. Top: Tankini top features a bralette silhouette. Fixed shoulder straps with cap detail. V-neck with faux center tie. Scoop back. Bottom: Bikini bottom features a classic silhouette with faux ties at the hips. Moderate rear coverage. Fully lined. Body: 86 percent nylon, 14 percent spandex Lining: 92 percent nylon, 8 percent spandex. Hand wash and dry flat. Imported. Measurements: Length: 7 in Front Rise: 7 in Back Rise: 7 in Product measurements were taken using size 8 (Big Kid). Please note that measurements may vary by size. If you~re not fully satisfied with your purchase, you are welcome to return any unworn and unwashed items with tags intact and original packaging included. The Splendid Littles Boarder Stripe Bikini Set brings timeless surf style to the consummate beachcomber. Two-piece tankini set features a patterned dot design that sets off the geometric, horizontal stripes. Lightweight, quick-dry swim fabric in a comfortable, stretch knit. Top: Bikini top features a sporty silhouette with strappy back detail. Scoop neck. Fixed shoulder straps with V-back. Straight hemline. Bottom: Bikini bottom features cut-out details at the hips. Moderate rear coverage. Fully lined. Body: 86 percent polyester, 14 percent spandex Lining: 92 percent nylon, 8 percent spandex. Hand wash and dry flat. Imported. Measurements: Length: 9 1 2 in Front Rise: 8 in Back Rise: 8 in Product measurements were taken using size 14 (Big Kid). Please note that measurements may vary by size. If you~re not fully satisfied with your purchase, you are welcome to return any unworn and unwashed items with tags intact and original packaging included. Paint a picture of swim chic in the Splendid Littles Watercolor Floral Reversible Bikini Set. 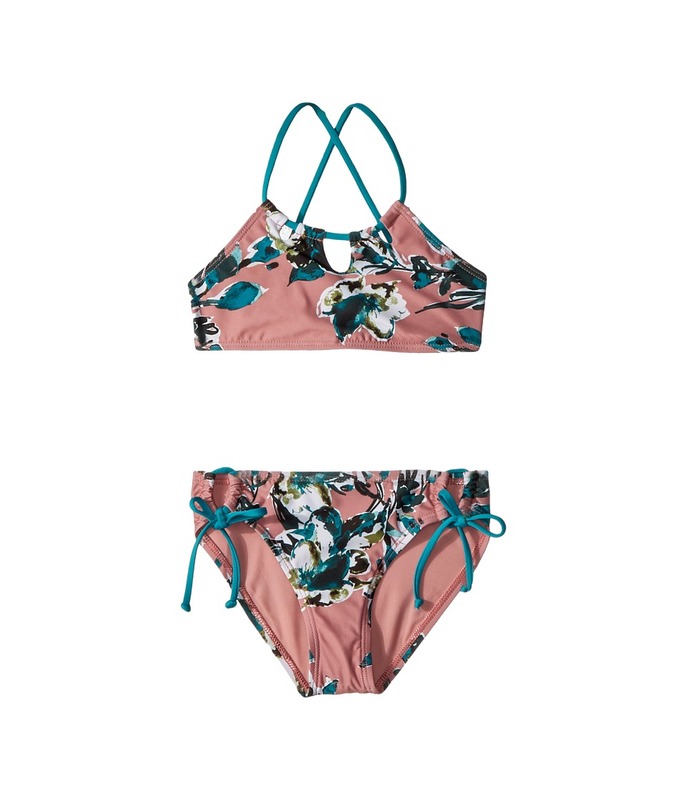 Two-piece bikini is reversible from a floral watercolor print to a solid face. Lightweight, quick-dry swim fabric in a comfortable, stretch knit. Top: Bikini top features a fixed, triangle silhouette. Adjustable halter tie. V-neck with lap front. Elastic, under-bust band with center back tie. Bottom: Bikini bottom features a classic silhouette. Faux ties accent the cut-out detailing at the hips. Moderate rear coverage. Fully lined. 83 percent polyester, 17 percent spandex. Machine wash and dry flat. Imported. Measurements: Length: 6 in Front Rise: 8 3 4 in Back Rise: 8 1 2 in Product measurements were taken using size 14 (Big Kid). Please note that measurements may vary by size. If you~re not fully satisfied with your purchase, you are welcome to return any unworn and unwashed items with tags intact and original packaging included. Paint a picture of swim chic in the Splendid Littles Watercolor Floral Bikini Set. Two-piece bikini features solid straps that complement the allover, floral watercolor print. Lightweight, quick-dry swim fabric in a comfortable, stretch knit. Top: Bikini top features a high-neck silhouette. Sliding neckline with keyhole front. Spaghetti straps with cross-back design. Center back tie. Bottom: Bikini bottom features a classic silhouette. Tunnel ties at the hips. Moderate rear coverage. Fully lined. Body: 83 percent polyester, 17 percent spandex Lining: 92 percent nylon, 8 percent spandex. Machine wash and tumble dry. Imported. Measurements: Length: 5 in Front Rise: 7 1 2 in Back Rise: 7 in Product measurements were taken using size 7 (Big Kid). Please note that measurements may vary by size. If you~re not fully satisfied with your purchase, you are welcome to return any unworn and unwashed items with tags intact and original packaging included. Paint a picture of swim chic in the Splendid Littles Watercolor Floral One-Piece. One-piece swimsuit features striking side cut-outs with an open back. Solid straps complement the allover, floral watercolor print. Lightweight, quick-dry swim fabric in a comfortable, stretch knit. Spaghetti straps feature a cross-back and lace-up center back tie. V-neck. Tunnel ties at the hips. Moderate rear coverage. Fully lined. Body: 83 percent polyester, 17 percent spandex Lining: 92 percent nylon, 8 percent spandex. Machine wash and tumble dry. Imported. Measurements: One Piece Length: 20 in Product measurements were taken using size 8 (Big Kid). Please note that measurements may vary by size. If you~re not fully satisfied with your purchase, you are welcome to return any unworn and unwashed items with tags intact and original packaging included. Paint a picture of swim chic in the Splendid Littles Watercolor Floral Surf Shirt. 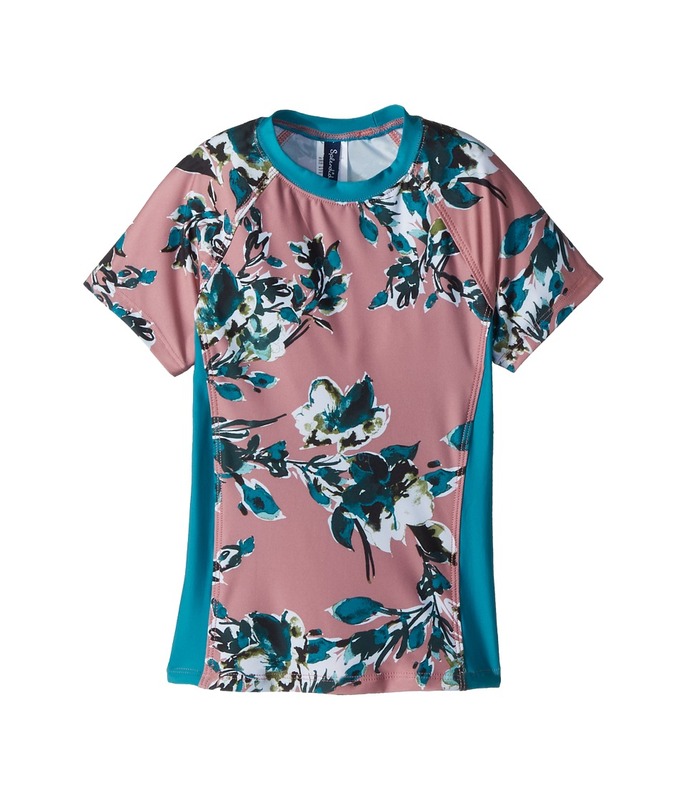 Surf shirt features a lightly fitted, rashguard silhouette. Solid panels complement the allover, floral watercolor print. Lightweight, quick-dry swim fabric in a comfortable, stretch knit. Mock neck. Short raglan sleeves. Contoured side seams. Straight hemline. 83 percent polyester, 17 percent spandex. Hand wash and dry flat. Imported. Measurements: Length: 18 1 2 in Product measurements were taken using size SM. Please note that measurements may vary by size. If you~re not fully satisfied with your purchase, you are welcome to return any unworn and unwashed items with tags intact and original packaging included. 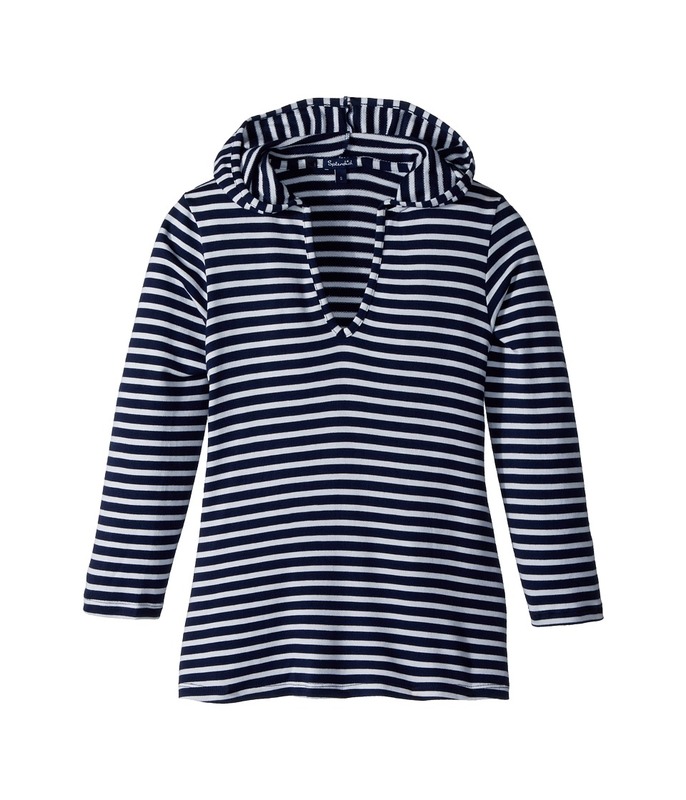 Layer up your post-swim chic with the perfect touch of nautical flair from the Splendid Littles Stripe Hoodie Tunic. Pullover swim cover-up in a longline, tunic silhouette. Crisp horizontal stripes set off the soft, lightweight modal knit. Attached hood. Notched V-neckline. Long sleeves. Tunic-length hem. 94 percent modal, 6 percent spandex. Machine wash and tumble dry. Imported. Measurements: Length: 22 1 2 in Product measurements were taken using size SM. Please note that measurements may vary by size. Put a little vintage cool in your swim chic with a Splendid Littles Reversible Tie-Dye Stripe Bikini Set. Reversible two-piece bikini set switches between a tie-dyed design and faded, three-tone vertical stripes. Swim fabric: &amp#8226 Lightweight swim fabric in a blend of poly and xtra life elastane. &amp#8226 xtra life elastane provides chlorine-resistant, abrasion-resistant protection to extend the life of the swimsuit. &amp#8226 Hydrophobic synthetic fibers provide quick-dry performance. &amp#8226 Stretch blend with high recovery to maintain fit. Top: Bikini top features a sporty bralette silhouette. Adjustable halter tie. V-neck. Under-bust band with center back tie. Bottoms: Bikini bottom features a classic silhouette. Full rear coverage. Fully lined. 80 percent polyester, 20 percent elastane. Hand wash and dry flat. Imported. Measurements: Length: 5 1 2 in Front Rise: 8 1 2 in Back Rise: 8 in Product measurements were taken using size 14 (Big Kid). Please note that measurements may vary by size. If you~re not fully satisfied with your purchase, you are welcome to return any unworn and unwashed items with tags intact and original packaging included. Put a little vintage cool in your swim chic with a Splendid Littles Reversible Tie-Dye Stripe Bikini Set. Two-piece bikini sets off the tie-dyed stripes with solid trim. Swim fabric: &amp#8226 Lightweight swim fabric in a blend of poly and xtra life elastane. &amp#8226 xtra life elastane provides chlorine-resistant, abrasion-resistant protection to extend the life of the swimsuit. &amp#8226 Hydrophobic synthetic fibers provide quick-dry performance. &amp#8226 Stretch blend with high recovery to maintain fit. Top: Bikini top features a high-neck silhouette. Crisscross shoulder straps with sliding, center back tie. Keyhole neckline. Straight hemline. Bottoms: Bikini bottom features a classic silhouette with tunnel ties at the hips. Full rear coverage. Fully lined. 83 percent polyester, 17 percent elastane Lining: 92 percent nylon, 8 percent spandex. Hand wash and dry flat. Imported. Measurements: Length: 1 4 in Front Rise: 8 1 2 in Back Rise: 8 1 4 in Product measurements were taken using size 10 (Big Kid). Please note that measurements may vary by size. If you~re not fully satisfied with your purchase, you are welcome to return any unworn and unwashed items with tags intact and original packaging included. 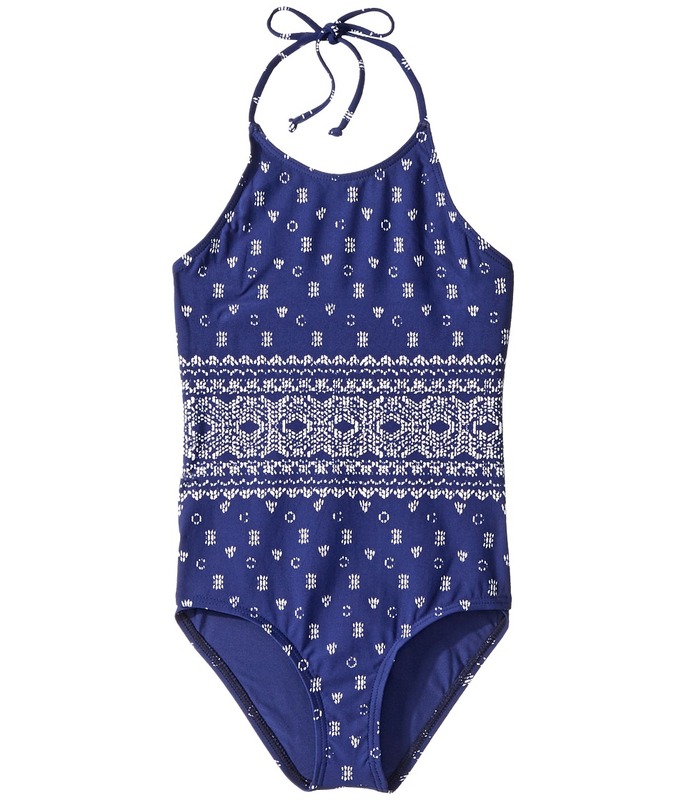 Put a little vintage cool in your swim chic with the Splendid Littles Tie-Dye Stripe One-Piece. One-piece swimsuit features multicolor vertical stripes in a washed and faded design. Swim fabric: &amp#8226 Lightweight swim fabric in a blend of poly and xtra life elastane. &amp#8226 xtra life elastane provides chlorine-resistant, abrasion-resistant protection to extend the life of the swimsuit. &amp#8226 Hydrophobic synthetic fibers provide quick-dry performance. &amp#8226 Stretch blend with high recovery to maintain fit. Scoop neck with faux, lace-up detail. Deeply cut square back. Supportive shoulder straps. Moderate rear coverage. Fully lined. 70 percent polyester, 14 percent cotton, 8 percent rayon, 8 percent spandex Lining: 92 percent nylon, 8 percent spandex. Hand wash and dry flat. Imported. Measurements: One Piece Length: 22 in Product measurements were taken using size 10 (Big Kid). Please note that measurements may vary by size. If you~re not fully satisfied with your purchase, you are welcome to return any unworn and unwashed items with tags intact and original packaging included. 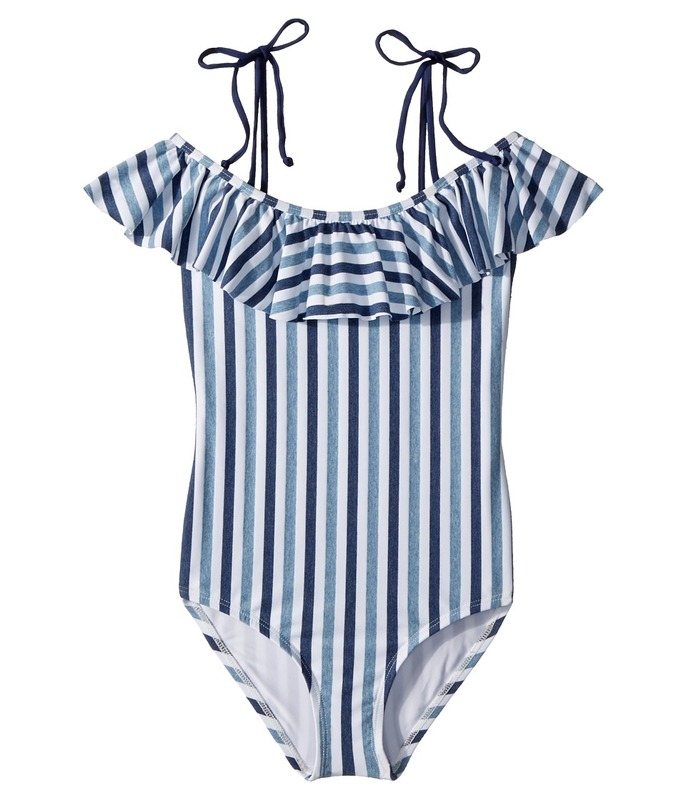 Put a little vintage cool in your swim chic with the Splendid Littles Tie-Dye Stripe Ruffle One-Piece. One-piece swimsuit in a chic, off-the-shoulder silhouette. Print features multicolor, vertical stripes in a washed and faded design. Swim fabric: &amp#8226 Lightweight swim fabric in a blend of poly and xtra life elastane. &amp#8226 xtra life elastane provides chlorine-resistant, abrasion-resistant protection to extend the life of the swimsuit. &amp#8226 Hydrophobic synthetic fibers provide quick-dry performance. &amp#8226 Stretch blend with high recovery to maintain fit. Narrow shoulder straps with tie detail. Ruffled fringe accents the neckline. Moderate rear coverage. Fully lined. 70 percent polyester, 14 percent cotton, 8 percent rayon, 8 percent spandex Lining: 92 percent nylon, 8 percent spandex. Hand wash and line dry. Imported. Measurements: One Piece Length: 26 in Product measurements were taken using size 12 (Big Kid). Please note that measurements may vary by size. If you~re not fully satisfied with your purchase, you are welcome to return any unworn and unwashed items with tags intact and original packaging included. Put a little vintage cool in your swim chic with a Splendid Littles Tie-Dye Stripe Tankini Set. Two-piece tankini set features a tie-dyed stripe design with solid trim. Lightweight, quick-dry swim fabric in a comfortable, stretch knit. Top: Tankini top features a lightly fitted, halter-top silhouette. Halter tie at neck. V-neck. Straight hemline. Bottom: Bikini bottom features a shirred, tab-side design. Moderate rear coverage. Fully lined. Body: 83 percent polyester, 17 percent spandex Lining: 92 percent nylon, 8 percent spandex. Hand wash and line dry. Imported. Measurements: Length: 18 in Front Rise: 7 1 2 in Back Rise: 8 in Product measurements were taken using size 8 (Big Kid). Please note that measurements may vary by size. If you~re not fully satisfied with your purchase, you are welcome to return any unworn and unwashed items with tags intact and original packaging included. Help her go for the gold this summer in the Splendid Littles Golden Girlie Banded Triangle Bra and Ruffle Pants. 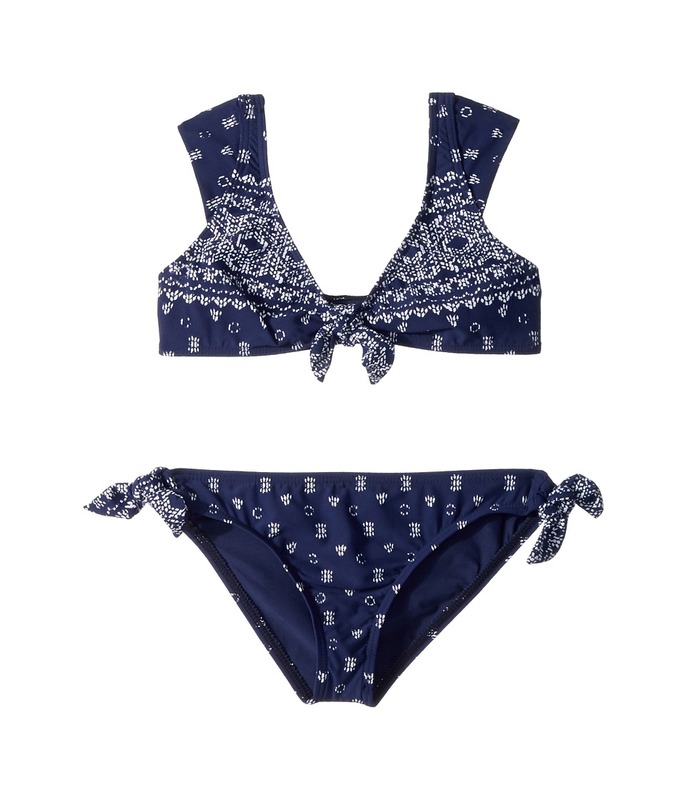 Two-piece bikini swimsuit features an allover floral pattern. Top: Bikini top features a sporty bralette silhouette. Adjustable halter tie. V-neck with ruffled detail. Center back slide closure. Bottoms: Bikini bottom features side ruffles. Full rear coverage. Fully lined. 92 percent nylon, 8 percent spandex. Hand wash and dry flat. Imported. Measurements: Length: 5 in Front Rise: 7 in Back Rise: 7 1 2 in Product measurements were taken using size 7 (Big Kid). Please note that measurements may vary by size. If you~re not fully satisfied with your purchase, you are welcome to return any unworn and unwashed items with tags intact and original packaging included.